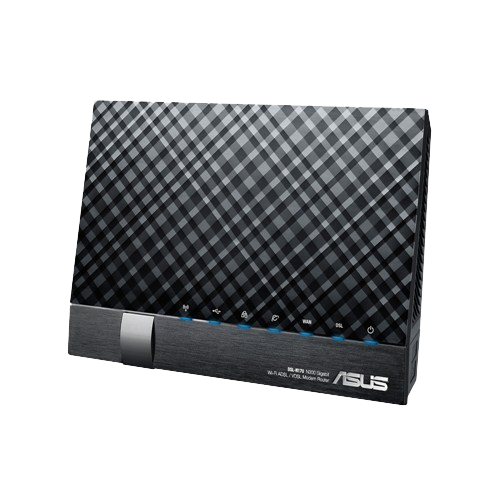 This Asus DSL-N17U Wireless-N300 Gigabit ADSL/VDSL Modem Router Firmware Update includes sereval improvements and bug fixes. Support Dual WAN Failover Guest Network control feature(WAN > Dual WAN > Guest Network Terminate Switch). Now supports Access Log feature, display client info(IP, MAC, Hostname, Connection started/ finished time) with auto-backup to USB function. Support URL Filter for Guest Network. Support auto-detect Germany ISP Deutsche Telekom: BNG service for IPTV. Support allow specified IP address to access device, via SSH, Telnet or UI. Prevent Brute Force/Dictionary attacks, now SSH/Telnet/UI would block attempted logins, 5 failed attempts leads to malicious access blocked for 5 minutes(LAN/WAN counter separated)/ with related syslog output. Check referrer of some web pages in GET command. Remove WLAN key in wps_info() for ensure security. Smartsync: Verifies the authenticity of the server's certificate. Smartsync: Set iptables rules only accept packages from local IP to smartsync port. Update SSH dropbear version to 2016.74/ integrate with Protection Server. SSH Authkeys length extended to 1023. Update AiCloud to v2.0.2.3/ fixed fail to get wan_ip in dual-wan mode. Fixed ATM/PTM default QoS badnwidth value display as NaN issue. OpenVPN Server: change to more secure default cipher setting. Fixed Guest Network > Access Intranet Disable, guest clients still could access AiCloud issue. Fixed possible USB Application page hang(stuck with upgrading) issue. Fixed USB disks mounted via hub, cannot add download task/ add the USB notify function to the programs when partitions are mounted/unmounted. Fixed possible no UI warning message when upgrade with invalid firmware issue. Fixed possible OpenVPN Server fails to work after system reboot issue. Fixed various UI related issues. Fixed NAS devices UPnP failed to work issue. Fixed Ethernet WAN connection problem with 802.1Q enabled. Fixed possible WiFi Guest Network SSID disappear issue. Remove option 42 in DHCP request option in non-default route WAN. Fixed OpenVPN Server cannot be used after system reboot. OpenVPN Server support generate TLS 2048 bits certificate/key. Fixed WebHistory filter rule issue/ caused by ACCEPT from Network Services Filter(IP Filter) before Web History rule. Fixed setting such as static IP/http/https/both and port change leads to system hang(web server crash). Fixed some issues that may cause TigerVPN OpenVPN service fail to work. Fixed it is hard for client to connect to OpenVPN Server in Load Balance mode/ cannot connect to openvpn server on LAN side issues. Add "Auto select channel including channel 12, 13" checkbox for 2.4GHz auto channel selection. Fixed dnsmasq does not respond to the query from OpenVPN. Fixed LAN can't access Internet after terminating VPN client connection. Fixed tunnel 6in4 not work in bridge mode issue. Fixed various SmartSync/ ftpclient related issues. DSL Log > INP display fine tune. Modify QIS > UK ISP BT Infinity 2 to BT Infinity. Update YouView IPTV Box settings for UK ISP Talk Talk. Further enhance G.INP control for UK ISP Sky Broadband.